Electrical design of Fuel and Oil facility. Subtilis Engineering was engaged from the conceptual stage through to the detail design, commissioning and handover stages of a large fuel and oil facility for Ravensworth North Mine. 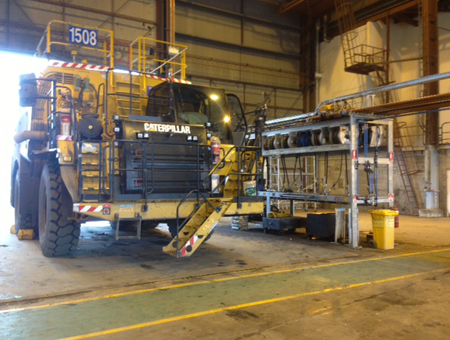 The facility was spread over several square kilometres with multiple types of lubricants for a significant range of mining and service vehicles. The electrical design was integral to the safe and reliable operation of the facility. Research and Development of a gas tube bundle sampling system. Due to our extensive experience with the Coal industry and hazardous areas. Subtilis Engineering was engaged to oversee and assist with the development of new style of Tube Bundle Sampling system. Subtilis was responsible for the design, equipment selection and project management of the system. The final design and construction of the tube bundle system saw large improvements in the management of the hazardous area around the Tube Bundle system with increased reliability and sampling rates. Conduct and arc flash assessment of the surface and underground distribution systems. Subtilis was engaged to conduct and audit of the existing distribution system. Modelling was conducted based on the audit to determine the incident energy levels and switchgear ratings for each node in the distribution system. Subtilis generated and auditable report and provided signage for each node. Conduct load flow and fault level modelling of the surface and underground 33kV and 11kV reticulation systems. Provide recommended protection relay settings for all devices. Subtilis Engineering was engaged to review and audit all system data and where required carryout onsite auditing to validate the data. The system was modelled and the recommended protection settings were provided in several formats to facilitate the ongoing maintenance and auditing of the settings. Replace the existing motor control centre on site in the minimum time possible to reduce operational risk. Subtilis was responsible for drafting the scope of works, budget and project schedule for the replacement of two large motor control centres. Subtilis went on to project manage the design, installation and commissioning phases. The project was operational within 9 weeks from the original switchboard failure. Conduct load flow and fault level modelling of the surface and underground 66kV and 11kV reticulation systems. Provide recommended protection relay settings for all devices. This project covered the commissioning of a 33kV/11kV open type substation and two 11kV switchrooms. Subtilis Engineering was engaged to undertake the commissioning ensuring the equipment was functioning as designed and was suitable for operation. 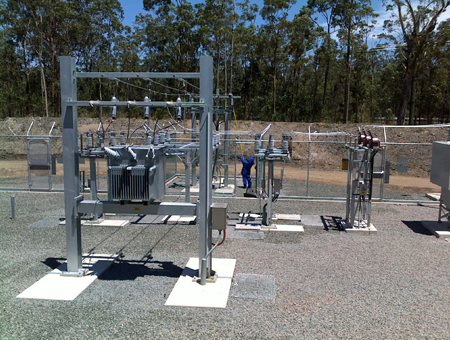 As part of the overall construction and installation of a 66kV / 11kV 19MVA substation, Subtilis Engineering was engaged to assist with meeting the customers specification. Subtilis Engineering was responsible for the protection study and determination of the required settings. In addition Subtilis was brought in as a senior role to oversee the commissioning of the substation. During the changeover Subtilis was responsible for ensuring that the existing substation was modified to suit the changes to the high voltage distribution system. Conduct load flow and fault level modelling of the surface and underground 33V and 11kV reticulation systems. Provide recommended protection relay settings for all devices. Subtilis was then engaged to implement these settings and to conduct regular audits to ensure system compliance. This project covered the communication interface between a new compressor and the existing SCADA system. Subtilis Engineering was engaged to design a temporary telemetry communication system to interface with a new remote air compressor and the mines SCADA system. Once the required infrastructure was installed Subtilis was then given the task of redesigning the communication system to interface with the new infrastructure. The project covered the removal of minimum oil high voltage circuit breaker with a Nulec type of recloser. Subtilis Engineering’s scope was to carryout the engineering to changeover from the minimum oil circuit breaker to the Nulecrecloser. This work included the replacement of the existing protections scheme and rigid busbar system. The project was aimed at understanding the maximum demand of numerous development panels at the mine to assist in the forecasting of the augmentation of the mines underground reticulation system. Subtilis Engineering drafted a project development plan for the power monitoring which would form the bases of the project. From this plan Subtilis Engineering was responsible for the procurement of the power monitoring equipment, interfacing with the mines production departments and drafting of a report detailing the findings from the monitoring. This work covered the modelling of the mines inter seam development panel to determine maximum demands, fault levels and protection settings. In very short notice Subtilis Engineering was able to interface with mine personnel to determine the scope of the work and carryout the modelling as covered in the project brief. Subtilis Engineering provided the required information in a timeframe that allowed the mine to start the development within the scheduled timeframe. Subtilis Engineering also assisted with the onsite programming of the protection relays. The mines drift winder was to be upgraded to a SIL2 rated system suitable for registration with the Department of Industry and Investment. Subtilis Engineering was engaged to project manage the design, installation and commissioning of this upgrade. This project was to carryout a design verification of an electrical installation for which the Public Work was managing. Subtilis Engineering was responsible for the review of the existing design and carrying out a redesign based on a site inspection with the principal. Subtilis also provided budget estimates for the installation work as per the redesign. The project was aimed at understanding the maximum demand of the mine to assist in forecasting the augmentation of the mines high voltage network connection. Subtilis Engineering drafted a project development plan for the power monitoring which would form the basis of the project. From this plan Subtilis Engineering was responsible for the procurement of the power monitoring equipment, interfacing with the mines production departments and drafting of a report detailing the findings from the monitoring. As a flow on from the protection study carried out by Subtilis Engineering an additional project was required to carry out an audit of the underground protection relays. Subtilis Engineering was able to provide the technical resources required to carry out the protection audit with the electrical switchgear in situ underground. Integra Coal approached the market for a new Longwall substation and required assistance to review the received tenders. Subtilis Engineering was engaged to draft tendering assessment guidelines and provide assistance with the assessment of the tenders.